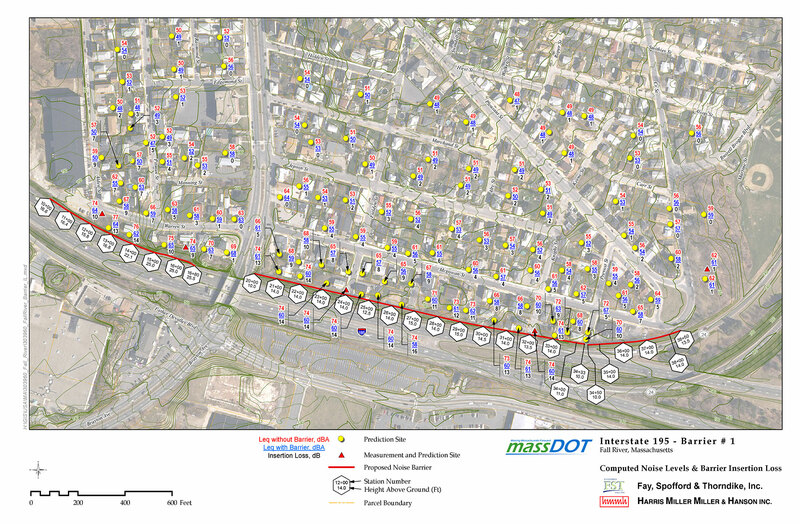 HMMH conducted a detailed noise barrier design study for a portion of I-95 in Fall River, Massachusetts. HMMH used the latest version of the FHWA’s Traffic Noise Model to conduct the noise modeling; compute noise levels and noise barrier performance throughout the study area; and to develop appropriate height, length and location for the noise barrier. The modeling accounted for the variability in the local terrain, especially adjacent to the interstate. The model also included the noise shielding effects of the rows of homes and buildings, to predict more accurately the sound levels at receivers behind these building rows. A model validation effort compared the measured sound levels to the sound levels predicted by the TNM simultaneously using the traffic counted. The recommended noise barrier is 2,535 feet in length, with height ranging from 8 to 25 feet above the ground. In addition to providing substantial noise reduction to 58 residences impacted by traffic noise, the barrier benefits 42 more dwellings less seriously affected by noise. HMMH presented the results of the study to members of the public, local officials and representatives of the local press during two separate public meetings. In 2014, HMMH conducted an investigation of the potential for shortening the length and/or height of the barrier to accommodate views of a commercial building sign at the end of the barrier.